Weichert Realtors – Wayne Murray Properties supports Candlelighters ChildhoodCancer Family Alliance. Candlelighters mission is to provide emotional, educational, and practical support to children with cancer and their families. In addition, Candlelighters desires to promote childhood cancer awareness, and the need for childhood cancer education and research in the Houston community. Please click this link to watch a video about Candlelighters. In September, Candlelighters will hold its annual fun run to raise much needed money for its Camp Cliff. Will you please take a moment to read this letter from a father who has been touched by the loving volunteers and staff of Candlelighters? You can make a difference for a child with cancer, Right Now, Today!!! We are the Camarillos, a Candlelighters family. My name is Gerardo Camarillo and with my wife, Dilma Camarillo, we were blessed with one beautiful daughter, Ivana Laura. Even before birth, Ivana had a tough time. Mom had to undergo surgery on her second trimester to remove some tumors that were outgrowing Ivana. It was at this time that a doctor first touched Ivana, moving her to get to the tumors. Having beaten the odds at such surgery, it came as a tremendous shock when on October 15, 1999 a pediatric oncologist told us that our ten month old Ivana had, among other things, Infant Leukemia. Despite a very poor prognosis, Ivana once again beat the odds and after chemotherapy and a bone marrow transplant, she is now a happy ten year old child. During her long treatment period, we became a Candlelighters family, joining other families that have been touched with childhood cancers and finding some joy amongst the nightmare. First it was just finding someone to talk to at parent meetings, someone who had gone through what we were going through. We were overjoyed when Candlelighters honored Ivana at the annual Lights of Courage Luncheon in May of 2002. The greatest surprise, however, came when we first attended Candlelighters’ premiere family outing, Camp CLIFF, a weekend retreat for children diagnosed with cancer and their families. The experience of Camp Cliff is unlike any other. It is the one place where a family can go and talk of childhood cancer with families that understand the horror you live through. More than that, it is a camp where you remember to have fun again, to laugh, to have a conversation that can be about cancer or about football. Ironically, it is a time to forget, at least for a moment, that childhood cancer can overtake your life. For our family, like many others that have been financially devastated by cancer, it is an opportunity to enjoy a family vacation that we could otherwise not afford. Candlelighters offer this wonderful, magical camp at NO COST, NOT A SINGLE PENNY, to their families. At the time when Ivana was diagnosed, and throughout her treatment, family friends would always ask, “How can we help, what can we do?” It is human nature to try to alleviate the burden, to help in anyway you can, to be part of the solution. Some of you may be in this situation at this time. Well, the answer is as simple as “take a walk.” On Saturday, September 11, 2010, the Candlelighters Fun Walk 2010 will be held at Hershey Park once again. 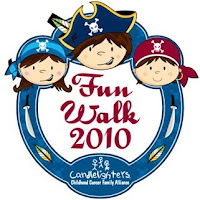 The theme this year is “Rock the Walk.” Now the Fun Walk is, as everything Candlelighters does, itself a celebration with a Kids area, food, music and fun for everyone. It seems like a carnival where you can’t help but have fun. The walk is part of the festivities. You can start by raising “Walk money.” Simply ask ten (10) friends, family members, co-workers, neighbors, etc. for ten dollars ($10) each. Of course the more donations, the better. Every walker who raises $100 or more will receive a walk t-shirt. You can be a Team Captain to recruit at least ten (10) walkers. A walk team can consist of family, friends, co-corkers, church members, neighbors, etc. who each collect money on Candlelighters behalf and walk with us. If you can’t participate in the walk, you can make an online donation. Simply go to http://www.candle.org/, and click on donate. Click again to make a donation. Under event donation select Fun Walk, either team or donation. Fill out the Team Name Team Weichert Gold, if any, and the rest of the information requested. It’s that simple. If you prefer, you can send a tax-deductible contribution of any amount, made payable to Candlelighters to help, to 8323 Southwest Freeway, Suite 435, Houston, Texas 77074. The Fun Walk monies support Camp CLIFF, so we hope that you will participate this year in helping us. Every dollar helps send one more child and their family to Candlelighters Camp Cliff. This year Candlelighters, like most charitable organizations, is facing funding problems due to our economy, so this year your participation is more crucial than ever. I am enclosing a walk brochure with more details, but if you would like more information about the walk, please don’t hesitate to call the Candlelighters office at (713) 270-4700. Thank you in advance for your support and we hope to see you at the Fun Walk on September 11th. Remember, You can make a difference for a child with cancer, Right Now, Today!!! Back to School - for You Too! What, me worry? Nah! Pass the Prozac, please. Ignore it and it might go away!